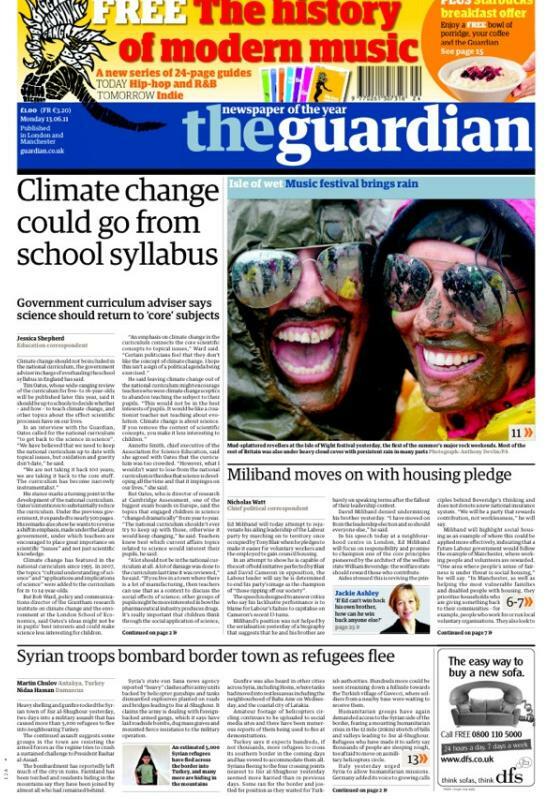 The Guardian has a climate change lead story today. As an isolated statement, “…get back to the science in science” sounds fair enough as you can’t become a scientist by just learning facts about one particular application of science. That said, I don’t know the National Curriculum very well at all – I had a quick read through KS4 a few years ago when I gave a talk to some physics teachers – but I don’t remember being overwhelmed by the amount of climate change material in there. That still seems to be the case. Maybe the curriculum is ready for an overhaul, though, as the science curriculum seems to make a point of not using the words “biology”, “chemistry” or “physics”, which seems a bit odd. Maybe I’ve missed something, please let me know if I have. However, this statement about excluding climate change seems to be in contrast to the original thinking behind the review when it was first reported in the Guardian in January. Then, the problem that seemed to be that subjects like geography and history had removed all the examples and facts (e.g. names of rivers, historical figures) in favour of understanding and interpretation. Why does this thinking not apply to science as well? Surely, by that logic, more examples of science applications should be included in the syllabus rather than removing the main one that is currently there. Maybe this review has uncovered evidence that prescribing examples is not a good idea but then you’d think that any good history or science teacher, according to the current curriculum, would advise waiting until all that evidence is available and analysed before getting on the front pages of the papers.